BEFORE READING FURTHER: WE DO NOT REPAIR APPLE PRODUCTS. WE DO NOT SUGGEST YOU USING ANYONE IN VALDOSTA TO REPAIR YOUR APPLE DEVICES. THERE ARE NO APPLE CERTIFIED DEALERS OR REPAIR TECHNICIANS IN OUR AREA. USING THIRD PARTY SERVICES WILL RENDER YOUR WARRANTY NULL AND VOID. This is a general price list of services we render...although MANY services are not listed here as they are specific to certain problems. Please call for more detailed quotes. This covers a wide range of issues---and generally everyone fits into this category. 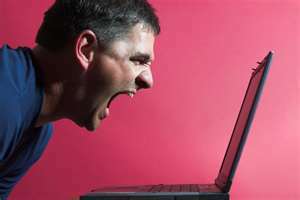 Popups, slow, fake viral scanners, cant get on the internet, toolbars, registry issues..etc. IE -pictures, music, documents. Sometimes this information is corrupt ---so we cannot guarantee that they will work, after cleanup. Some viral cleaning programs will detect these files and remove them....We do stress that you try to save information off your computer regularly. If we have to save information or retrieve it, hourly charges may apply depending on the amount of information needed to be scanned and saved. (This is very labor intensive and is subject to time involved....mainly because of the kinds of information requested to be saved) (All back-up disks are $10 each ) *although it is much cheaper to bring in a back-up source of your own. Please note...we do not look at your photos or inspect your movies or music, PRIVACY IS RESPECTED HERE! We do not run your programs such as E-mail Services, I-Tunes, Quick-time, Facebook, Burning Software, Office Programs or any other software not related to the Operating System, for this fact we do not know if any of those things are infected and cannot guarantee that the basic service will fix them. there are a few more that are in this category, but these scams change so often that the name changes as well. up to $150.00 --which is the limit! Windows XP and Windows Vista are no longer supported and are installed upon request only. Windows XP and Vista take longer to install, and require major updates, so be prepared to wait for fix about 1-3 days. depending on make,model, and availability.--Time involved? about 3-8 business days (meaning Mon-Fri) shipping is where the wait time is estimated...screens are replaced same day as received...so if you bring us the part..you can get it back generally within 1-2 hours. normal retail rate for a replacement drive. Prices vary according to the brand of the device. Labor charge on screens STARTS AT $60 depending on if it is a digitizer or whole screen. Software---Kind of tricky---a lot of tablets have proprietary software, so addressing that issue is really hit or miss...for any company...but it costs you nothing if we don't fix it, so that's a PLUS. Call us with any questions about compatibility, we need only part numbers, specs, and desired usage for us to give you the best possible advice. We provide an ordering service for our customers for a small fee of 15% above cost (normally $1.00-10.00 for the service)--we can order any part that you might require for your computer, such as memory, ac adapters, video cards, power supplies, motherboards, cases, cables, etc. Whether it is a laptop or desktop, the prices vary depending on the severity of the problem. All "viruses" are not created equal. Many problems that customers encounter are not true Viruses...they are in fact, malware/trojans/rootkits/registry problems/ad-related pop-ups(simulated virus protection programs)/ and Operating System problems. For this reason, the price is hard to distinguish, until scans are made of the system. Running these scans takes a considerable amount of time depending on the computer and how much information is on the unit. Viral scans and basic Operating System maintenance is $110 and up depending on the size and severity of the unit. And that you have a valid certificate of authenticity (COA). Please understand that what you want saved, does cost...so please tell us what it is and we will tell you at that time what the cost will be...reason for this is, there are many ways to save information...if it is simple..cost can range from $40 and up depending on the amount of information and the ease of retrieval. We will order any part for you, but this does cost 15% over whatever the part costs. This is for all those people who have no idea what is wrong with their computer and just want to find out what happened and how much it is to fix. Leaving the unit overnight or longer may be required to determine the problem...please understand that we are not magicians, we cannot determine what is wrong with your unit, simply by description. 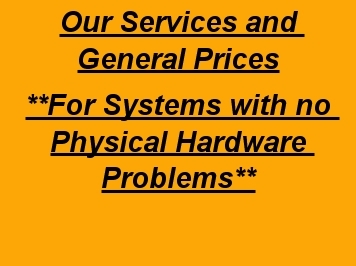 A TRUE AND ACCURATE QUOTE/ESTIMATE OF YOUR PROBLEM REQUIRES US TO PHYSICALLY TOUCH AND INSPECT YOUR COMPUTER. PLEASE, DON'T MISUNDERSTAND, WE WANT TO GIVE YOU A QUOTE OVER THE PHONE, BUT HONESTLY, WHY WOULD YOU TRUST ANYONE, WHO BLINDLY GIVES YOU A PRICE, BEFORE THEY EVEN SEE IT.